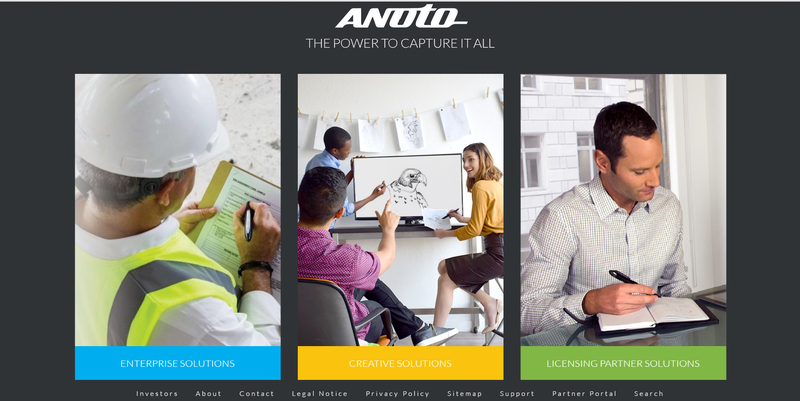 Anoto is a global leader developing digital writing and drawing solutions. data between a PC and a digital pen through Bluetooth and USB; penUpgrader, an application for updating pen firmware; AFP Document Tools, an application to show how digital paper can be designed, printed and viewed with AFP, and many more. Anoto is a leading Swedish digital writing company that engineers, develops and markets mobile data capture solutions for handwriting. Anoto‘s main product is the Anoto Digital Pen, a combination of an ordinary ink pen and a digital camera (as well as supporting hardware) designed to digitally record everything written with the pen. The pen works by recognizing a special non-repeating dot pattern that is printed on the paper. The non-repeating nature of the pattern means that the pen is able to determine which page is being written on, and where on the page the pen is. The digital pen technology has multiple applications in such industries as healthcare, pharmaceuticals, education, financial services, transport, and logistics. It practically eliminates the need for manual data entry and provides almost instant information to clients. Anoto solutions cause minimal workflow interruption, speed up invoicing time and facilitate tracking, tracing and signature capture.